smash of Avengers: Infinity War than with your own novelty money featuring it? evil of the universe alone, no matter your differences, race, upsets, or anger. true originality that no one else will have! use it as part of your Marvel collectibles, and even start a new comic group with this as your logo! in stores, it adds an edge to your own collection that no one else will have. Take advantage of the popularity of Avengers: Infinity War and create your own Marvel novelty money. an old-fashioned, popular option most people have forgotten to utilize. and immortalize this iconic Marvel movie, Avengers: Infinity War! This Special Edition Collectible Dollar Bill was designed by American Art Classics artist, Judah Dobin. 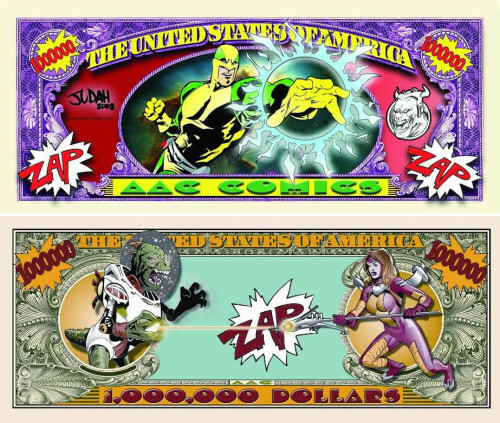 Judah interned at Marvel comics and the characters on this bill are his own creation and were done exclusively for American Art Classics.